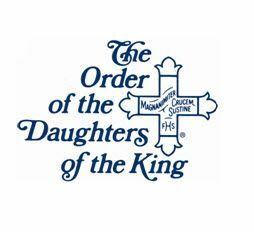 The Order of the Daughters of the King is open to all women in the Episcopal Church and the Anglican Communion. A daughter pledges herself to a life-long program of prayer, service, and evangelism, dedicated to the spread of Christ's Kingdom and to the strengthening of the spiritual life of her parish or mission. Daughters have made the commitment to follow and serve Jesus Christ, and wear crosses as an outward and visible sign that they cannot live a day without Christ in their lives. Empowered by the Holy Spirit, the vision of The Daughters of the King is to know Jesus Christ, to make Him known to others, and to become reflections of God’s love throughout the world. Through membership in the Order women are strengthened through prayer and study and supported through community with other Daughters. Members of the Order commit to a Rule of Life which includes the Rule of Prayer and Rule of Service. As part of each Daughter's individual Rule, she commits to pray daily for her clergy and offer assistance in the spiritual up-building of the parish. The Daughters of the King was founded in 1885 by Margaret Franklin in New York City. The Order has grown into an international spiritual sisterhood of over 25,000 Daughters. Members of the order are communicants of The Episcopal Church, of churches in communion with it, or of churches in the Historic Episcopate. Today DOK'S membership includes women in the Anglican, Episcopal, Lutheran (ELCA) and Roman Catholic churches. The formation of several new chapters of The Daughters of the King is a process involving study and a required period of discernment. It is the hope of the Convocation and the DOK that the work of these women will take hold and thrive bringing a new and prayerful harmony to their lives and to the service of God's mission for his church in Europe. 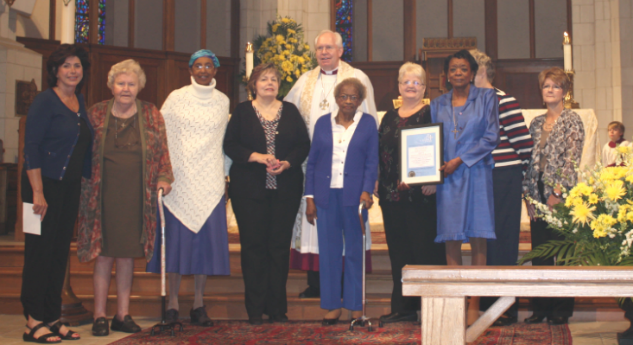 DOK Regional Coordinator for Europe, Dr. Rosemarie Valentine, and DOK representative, Krista Jackson, present the charter for The Gifts of the Spirit Chapter to the vicar of St. Boniface, The Rev. Dennis Krumlauf. The crosses for the four new members of the Augsburg Chapter were presented to be blessed by The Rt. Rev. Pierre Whalon, Bishop of the Convocation of Episcopal Churches in Europe.